My name is Mitchell A. Riley, I am from Chippewas of the Thames First Nation or Deshkaan Ziibing (Antler River) located in South Western Ontario Canada. I am an indigenous artist and a Canadian leather crafter / leather worker. I specialize in a certain type of leather work that is uncommon on the pow wow trail, at least in my area. 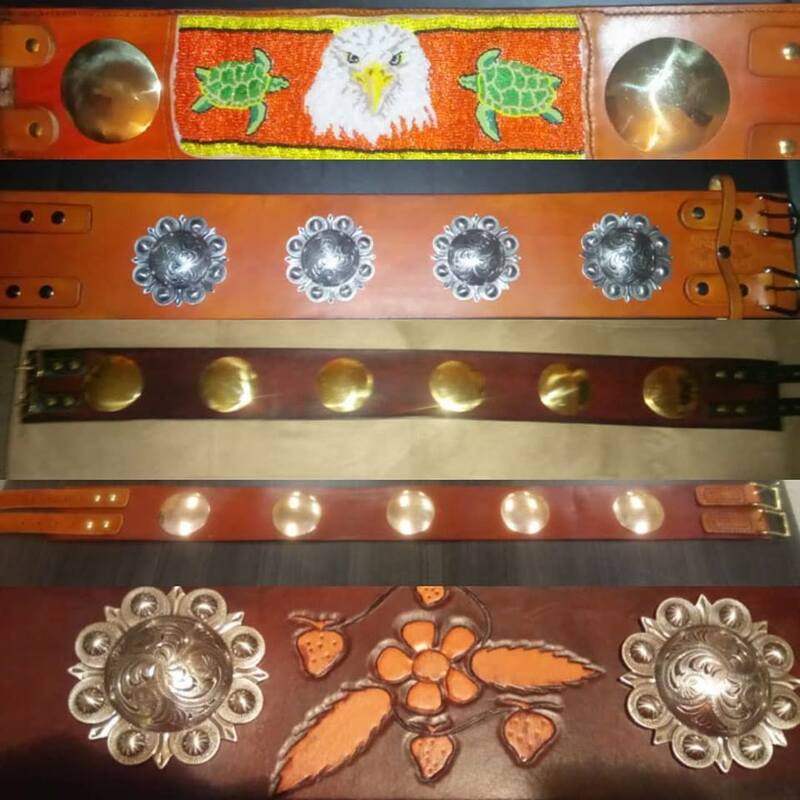 I hand carve and tool popular and original leather designs into veg-tan leather, I also specialize in a unique styling of regalia belts using what I know about designing floral style beadwork and applying it to the leather carvings that I do. As far as I know I am the only one doing this and my belts have made it as far as Mt. Pleasant, and the Northern Border of Manitoba. My background is Ojibwe, I grew up on reserve learning a lot about crafts from my grandfather at a very young age I was grandpas helper cutting lace, leather patterns, . In 2015. I started to get back into the craft work and just last year traveled my first pow wow trail. In the last two years I have expanded what my crafting knowledge to include traditional and modern leather work. I have self taught myself using the internet (wonderful instructors on youtube from as far as England) and other resources readily available such as books and ebooks. I also continue to teach myself to do new things through trial and error or making new gifts for friends and family. Currently, I am looking to make this a full time career towards indigenous artist and leather crafter. I set up at local events in my community, and I am planning on traveling the Southwestern Ontario Pow Wow Trail as often as I am able. I have future plans to one day travel to a leather studio in Toronto to learn how to make leather shoes and boots from other leather professionals in the shoe industry. Potential customers may contact me directly on my cell # provided or on any one of my social media links. Powwow Circuit Registering for UWO London Campus, pow wow on November 24th, 2018. So far unconfirmed but this will be my last pow wow of 2018. In a average season I travel to: Fanshawe London Campus Pow Wow, Kettlepoint, Sarnia, Six Nations, Muncey, Chippewa, and London Solidarity Day. I am also on a local makers “circuit” for London Ontario participating in a wide range of shows all year long. Some past non-indigenous events I have participated in are: The Gathering on the Green (I and II) for 3 years, Two of a Kind Craft Sale and charity event 2017 hosted by MS Society of Canada London Chapter, London Arts Festival Downtown London Ontario Pop Up Shop in Imaginative Group Londons office space, and London’s Handmade Market that operates monthly in East London.